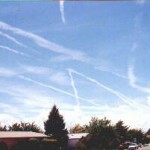 Santa Fe, NM was sprayed heavily with aerosols on August 14, 1999. 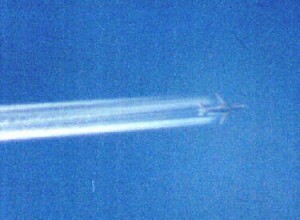 Amongst those planes which were observed spraying, this one was unique in that the aerosol was especially thick, dense and appeared to encompass the full wing span of the aircraft. These photographs were subsequently taken with a 1200mm lens, and confirms what naked eye observation also indicated. They demonstrate a new method of spray delivery, which appears to involve an entire array of nozzles attached to the wing assembly, similar to the traditional forms of crop dusting. Careful analysis will indicate multiple trails emananting from the aircraft, with a reasonable estimate of at least 8 or more visible. One of the trails can also seen to be originating from the center of the aircraft. Careful analysis will also show the outer trails in alignment with the wing tips, where the engines cannot be located. These conditions, along with others, preclude any possibility of normal engine contrail association with this aircraft. This photograph adds to the growing body of incriminating evidence which verifies that aerosol spraying is occurring over the United States. outrageous examples yet that confirm some sort of unpublicized high altitude(above FL 400) spraying activity. As an active pilot for over 35 years (7,000 hours+) flying Civilian, Military, and Commercial jet airplanes and helicopters, I can unequivocably state that the aircraft emissions in these pictures are in NO WAY just engine exhaust contrails”. 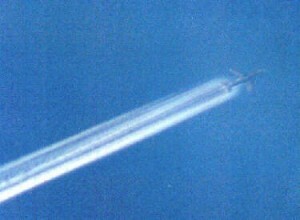 The four photographs at the bottom of this page show various views of the above aerosol over approximately a 10 minute interval after the aircraft passed. This aerosol displayed the normal progression of expansion and transformation into a cirrus type layer. The best estimate of the altitude of the aircraft shown above is currently 40000 ft. above mean sea level, which is subject to a estimated error of approximately +/- 5000 ft. The photogrammetric method used to estimate altitude is presented elsewhere on this site, although this particular case required a reduction of the slant range to the vertical. Commercial aircraft are stated to fly most commonly between 33000 and 37000 ft. above MSL. The two photogrammetric estimates of altitudes of identified aerosol planes now completed both indicate that this spraying activity is most commonly occurring above commercial flight traffic.